Now a Top Twenty Amazon Bestseller. When I opened my heart, it was for the men I couldn't have. 5.0 out of 5 starsJace Montgomery has arrived!! Jace Montgomery has arrived, and boy oh boy does he has some baggage. Absolution has left me feeling like my emotions have gone for a ride on the roller coaster and just when you think the ride is over you take off again. Reeling from the death of his wife Jace has shut down, work and drinking are his priorities and anything else is just a footnote. Sydney was giving up on men and focusing on her work, when her best friend gets married she takes it upon herself to make sure that the grooms brother doesn’t ruin the big day. From the moment Sydney introduced herself to Jace she didn’t treat him like he would break, she pushed and pulled him in the direction he needed; bringing the light back into his life. They built a friendship that turn into more, Jace could not stop thinking about her and the chemistry was undeniable. Sydney doesn’t expect to have an instant pull towards Jace leading her down the path which she knows so well, falling for the unavailable guy. When Sydney drops a bomb shell Jace reacts is the worst possible way, does he have the strength to let go of the past and let the light that is Sydney into his family making them whole again. I personally loved this book and I think that shows when you reading into the early hours of the morning not being able to put it down. This book is raw and emotions run deeper than you ever expected. Harrison has put her blood, sweat and tears into this book to create a masterpiece that is Ab-so-lu-tion. Can two broken souls possibly fill the gaps in each other and will it be enough? This is something to think about as we read Absolution. Firstly, I loved the cover the instant I saw it. Now, I did enjoy the story but I didn't always agree with the actions of the protagonists. Despite Sydney knowing that pursuing a relationship with Jace was a bad idea, she continued to convince herself that she needed to help him. It was clear that Jace was not in the right head space for a relationship and didn't treat Sydney the way she deserved. 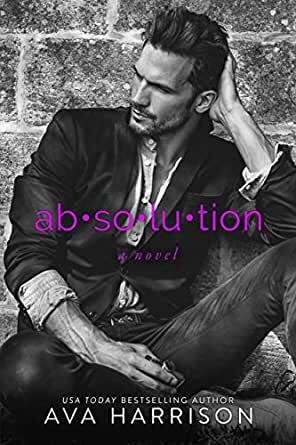 But like the title states, absolution is found. It isn't easy but the protagonists find a way to absolve themselves. The story is filled with gut wrenching moments and some sensitive issues but Ava Harrison does a wonderful job dealing with this topics. What we are left with at the end is a sense of hope that every cloud has a silver lining. After darkness, there is the sunlight that will light the way and remind us that we can live after sadness, if we only remember to forgive ourselves and others. Oh my goodness. This book!!!! This is my first read from this author and what the heck am I doing only just finding her now? Where have I been, and where have these books been hiding? I now need to go back and read them all! This book is just amazing. The emotions swirling in the writing of this novel are so beautifully written. I could not get enough of Sydney and Jace’s story. Sydney has not had the best track record with men in the past. Always falling for the ones that will never truely be hers. She has been hurt by love, and doesn’t think she will ever find the one she is meant to be with. Jace is broken. He has lost his wife in a tragic accident and truly does not know how to go on. His emotions in this book will rip your heart apart. I felt for him. I could only imagine what pain his character was going though. The writing in this book was flawless. Every word had meaning, every emotion was palpable. I felt this book, the connections, the anger, the heartache, I felt it all while I was reading, and that just makes this book amazing in my eyes. I feared up a little while reading this novel, My heart broke more than a couple of times. I just loved the reactions I had to this book. I was captivated from the very start, the writing pulled me straight in, I could not put it down. I can not wait to see what other books this author has written! I highly recommend reading this book. I have to say that this is the first book that I have read by this author and I think I may be hooked now. Ava you made me feel Jace's pain and also his hope when Sydney came in to his life and refused to leave. I could almost feel the sun on his face when he stood in her light and the chill when he stepped out of it. While he was broken you didn't make me feel pity, anger or bitterness for him you just made me perhaps understand his pain. I loved to natural progression of this story and of course i'm a sucker for a HEA this was emotional without being OTT great storytelling. I'm ready for another one now. The ups and downs of grief and how we can lose ourselves in sorrow if we choose to. Sometimes all it can take is one person to help us realise that happiness is a choice and guilt can be toxic. SYDNEY has her own struggles but a big part of her personality is to be the saviour. In Jace Montgomery’s case this is a godsend because Sydney puts up with a lot from him but in the end it all works out. Beautifully emotional and messy. I loved Jace but Sydney’s positive attitude has you crossing your fingers for her happy ever after. Wow - this was a really powerful story!! Packed with plenty of emotions, tragic real life history and characters who were very, very broken. Jace and Sydney definitely don't have your standard HEA story but it is a love story. A love story where I spent half the time yelling at my Ipad and the other half feeling sad for them. If you need a book to make you think and probably cry then this one's for you. Can I also just say that this cover might be one of my favourites this year. Stunning!